Well, I’m not going to get any work done today. Nothing wastes a day (and a checkbook) away like a good ol woot-off over at woot.com. If you’re lucky enough and fast enough, you may even get a chance to win a Bag of Crap. Good luck! 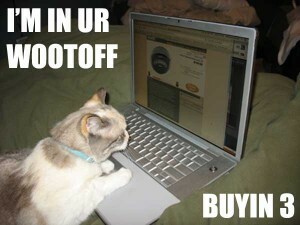 This entry was posted in Deals and tagged bag of crap, boc, woot, woot-off on August 17, 2011 by David.